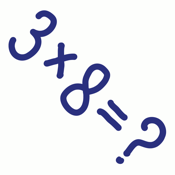 With 'KruisTafels' you can play with numbers and practise the multiplication (times) tables from 1 to 12. Try to solve the puzzle soon as possible by dragging the numbers to their right positions (questionmark). Improve your score and become the best table solver in the world. Your score will be stored in Apple's Game Center. You can extend KruisTafels so you can practise the times tables from 1 to 12 separately or play with friends or others in multiplayer mode.